Skin will get darker. He had the steroid injection two weeks ago. Reader Question: How To Stop Canines From Licking Their Paws? 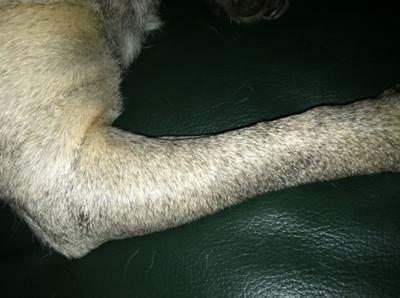 I have two male fawn pugs (ages 8 and 10, not related) with excessive paw licking. Their skin has turned grayish/black. You can see in one of the photos below of one of their paws that the black shows through a paw that used to be all tan/fawn in color. Their vet has given them two steroid injections and the licking stopped for about 3 to 4 weeks the first time and less time after the second injection. The licking started back up gradually. During that time, their skin returned to their light/pinkish color it used to be. Their vet doesn't want to give them any more steroid injections and recommends taking them to a skin doctor, which I was told is going to be very pricey, especially since the cost is multiplied by two. Is it possible that this could be a simple allergy to food that I could troubleshoot myself? Any ideas? allergy. Pollen, mold, insects, and mites are the most common culprits. 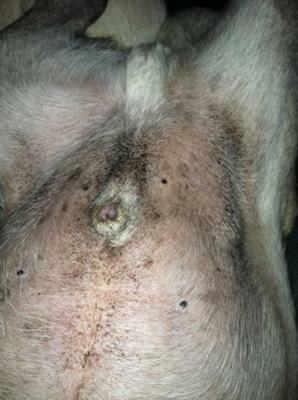 If this is what is going on with your dogs, bathing them once or twice a week with a shampoo designed for allergies, using a topical products like Dermoscent or Duoxo Seborrhea Spot-On to increase the barrier properties of the skin, and giving your dogs an antihistamine like Benadryl (at a dose recommended by your veterinarian)might help. Dogs tend to do better when receiving all three of these therapies together (or at least two of the three) than with any one alone. I’ve had the best luck diagnosing food allergies using an eight to twelve week food trial during which the dogs eat nothing but a hydrolyzed diet like Purina HA or Hill’s z/d (your current vet can prescribe one of these foods). You need to feed this and only this (no treats, flavored medications, etc.) during the entire food trial. If your dogs’ symptoms disappear or at least get much better, you have diagnosed them with a food allergy. Then you can decide whether you want to continue feeding that diet or gradually reintroduce ingredients until you find the one(s) she reacts to so you can avoid them in the future. If neither of these approaches works, it’s definitely time to make an appointment with the veterinary dermatologist.